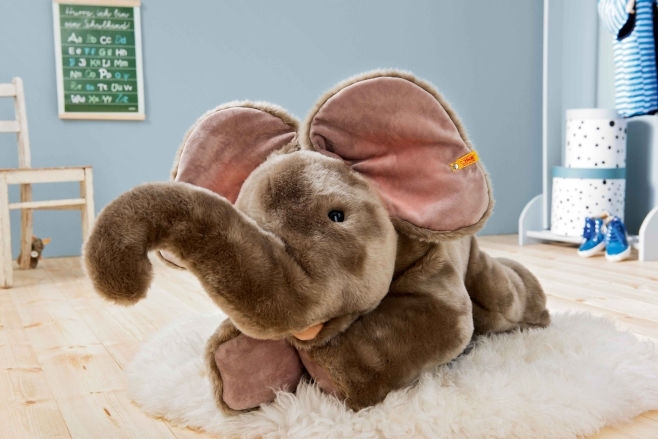 Lying elephant with a size of 85 cm with soft fur to cuddle and play. A new member of the Trampili family can now delight with his sight. Trampili Elephant is 85 cm tall and dressed in cuddly soft grey plush. His inner ears and soles are made of plush in lighter grey. His mouth is made of pink velvet inside. The inner ears are painted in pink. The widely travelled, relaxed little guy is so cute that you just have to love him.